Whether discussing automation, artificial intelligence (AI), or robotics, the crux of the matter always seems to be that robots are coming, and they're coming to take our jobs. This is a controversial topic, especially in the world of manufacturing, but one worth not shying away from since, as we've found, robots bring far more benefits than you might think. Benefits for companies and ultimately - and perhaps most surprisingly - for the modern manufacturing workforce. So today, we're going to roll up our sleeves and get down to business. Let's look at whether or not robots are taking our jobs. First things first. 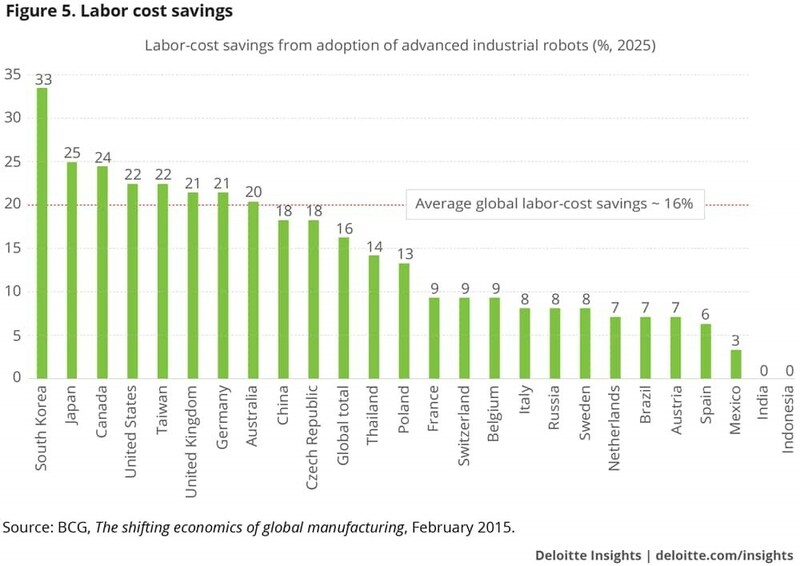 Are robots taking away manufacturing jobs? Some sources say yes, and some say no. But it's not that simple. In truth, the answer is both yes and no. Here's how. We won't beat around the bush; it's commonly known that U.S. labor costs are higher than other countries around the world. Other developing countries pay their workforce far less than we do. As a result, their goods and products can be cheaper than domestic sources. The result? Foreign competition continues to grow. In the U.S., we're also benefiting from one of the best economies in years. In June, the Wall Street Journal reported that the U.S. had more job openings in spring 2018 than unemployed job seekers. This is great for workers. It's not so great for employers. Our workforce situation has shifted from one where employers had the upper hand to one where job seekers have the upper hand. During the Recession and shortly afterwards, employers held the reigns. They had a huge pool of people to choose from and could afford to be picky. But now, it's the reverse. Job seekers can afford to be picky, and employers must cater to them. Consequently, a major trend has hit the U.S., especially in manufacturing: employers are having a hard time filling jobs or even retaining the employees they have. High workforce costs, coupled with a workforce shortage, is hitting manufacturers hard. And to stay profitable, employers are having to raise prices on their products and parts because they are either paying more for labor or because they don't have the labor to support the work they have. Obviously, this hurts a company's bottom line. And to cut costs, industries are looking into ways to run their operations more efficiently with fewer people. They're doing this with automation - with robots. We see this now in different kinds of manufacturing. For example, structural metal product manufacturers (which manufacture products like bar joists, transmission tower sections, and reinforcing bars) are using automation to fight the growing threat of foreign import competition. Per a recent industry report by IBISWorld, repetitive tasks that are usually performed by low-skill workers are being replaced by new manufacturing technologies like robots which load and unload parts. And here's the rub: this does help companies save money. So how does Mau Co. fit into this new robotic world? As stated above, we see an opportunity using robotics in highly-repetitive tasks that require no human element. We believe that the 'staging' of parts - that is, the loading and unloading of parts into production equipment - is a logical first step into the robotics realm. By automating this process, we improve productivity by increasing efficiency. And because improving efficiency is at the heart of all manufacturing processes, Mau Co. continues to re-set the bar in a globally-competitive environment. So, in one sense, yes, robots are taking over manufacturing jobs. But in another sense, they're not. Learn more in the next post in our series about this topic!